The large intestine is mainly responsible for storing waste, reclaiming water, maintaining the water balance, absorbing some vitamins, such as vitamin K, and providing a location for flora-aided fermentation. This beneficial bacteria (gut flora) and fermentation helps keep the colon clean, strong and healthy as well as keeping the waste moving through the bowels. How can I tell if I am ‘toxic’? This condition is prevalent in all civilized societies. Common signs include headaches, backaches, constipation, fatigue, bad breath, body odor, irritability, confusion, skin problems, abdominal gas, bloating, diarrhea, sciatic pain, and so forth. Intestinal toxicity is part and parcel of many people’s everyday experience. Many people find the benefits of colonics bring about motivation and enthusiasm to institute additional positive changes in their lifestyle. The keys to a heathy colon is to get it functioning well and to eat real food. 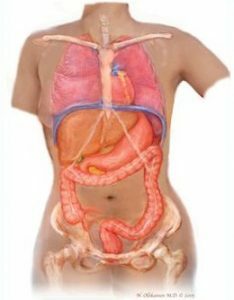 To get the colon functioning well includes colonics, correct food for you, fermented food and/or probiotics to get the bacteria balanced, possibly fiber supplement, digestive enzymes and maybe a few more things if needed. It depends on where your digestive health is currently for what you personally need. In our time, the hardest thing on our guts is processed food and the things that upset the beautiful balance of bacteria in the gut, for instance anti-biotics, steroids, and chlorinated water. Emotions are held in the gut and letting go of negative emotions is also very helpful in getting the colon working well. Many people find a colonic a great way to release negative emotions. Feel the amazing, invigorating benefits of a series of colonics! Wow!!! There are many cleanses available on the market. Cleanses work much, much better when combined with colonics. Cleanses release waste/toxins from the tissues and need to get OUT OF THE BODY! Fiber give the colon something to grab onto to move the food along. The insoluble fiber act sort of like a broom for your intestines and the soluble fiber absorbs toxins and lubricates the colon. Eat your veggies!!!! This page covers contraindications, or conditions in which receiving a colonic may not be advisable.